Or to be more accurate, a tale of three little girls. Our story starts in a place to the north of here, where H’s cousin and his wife live in (currently) snowy Scotland. It’s a big family and these are technically second cousins and it happens that they are several years older than us. P and C have three sons, now in their very late teens and early twenties and it seemed to all around that they had survived stage one of parenting; their children had reached adulthood. Time to kick back and worry about the next stage of these boys’ lives. But P and C are very special people and they felt that there was room around their table for another little one in need of a family, and so they have spent many years looking into adoption, domestic and international, but with no joy. Until, this year, they got a call from their adoption agency in the UK to tell them that they had a little one year old baby girl. They asked a little bit about her background and learned that she was the youngest of five children, all put up for adoption; two boys and three girls. The boys had already been adopted but the three girls were looking for families and their new daughter was the first to be adopted. 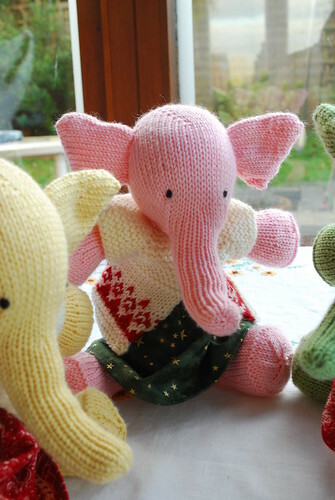 P and C didn’t want to see this family split up any more than it had to be, and so told the adoption agency that if it was OK with them, they would happily take all three. And so these lovely people went from three grown sons, to three grown sons and the expectation of a daughter, to being parents of six; the three boys and Miss N (age 1), Miss K (aged 2) and Miss L (aged 4). My sister in law has been to meet them, and says they are blond, cute and having a whale of a time. And as I respond to all new family arrivals by pulling out the knitting needles, I went in search of yarn and started the great Christmas/welcome to the family present endeavour. 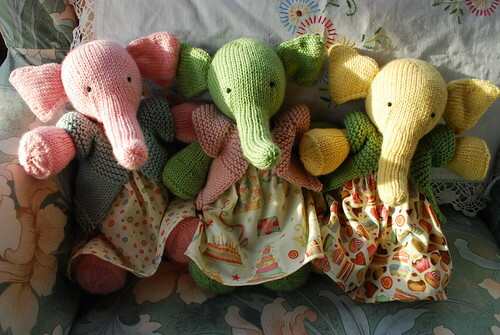 Three small Elijah elephants from the Ysolda pattern. 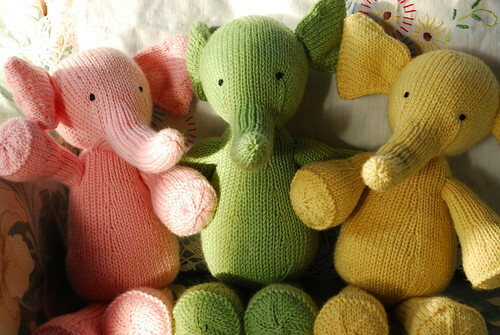 Last known to be called Little Pink, Little Green and Little Yellow; real names currently unknown. 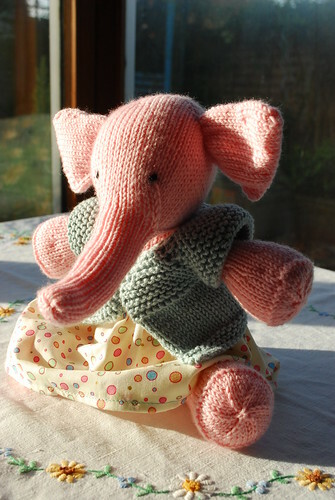 The yarn is Debbie Bliss Baby Cashmerino which has got to be my favourite yarn for these little toys – it knits up into a velvety fabric that is incredibly soft and cuddly and, if necessary, it will go in the washing machine. 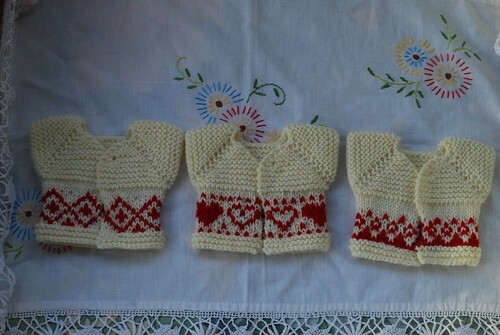 Little Christmas jackets (made out of some Patons Diploma Gold), to this pattern, with some made up fairisle for festive cheer. 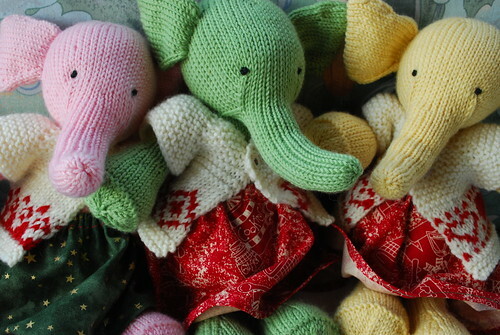 Little Green and Little Yellow have the same pattern skirt – red with white drawings of cookies and gingerbread houses and candy canes – which came from a fat quarter bundle that I bought in New England years ago. 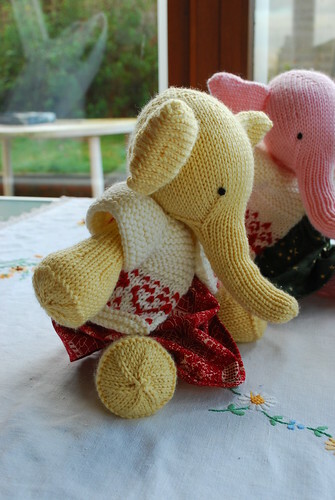 But it isn’t Christmas all the time, and the feedback from my little cousin Peggy (age 3) is that she really enjoys playing dressing up with her Bella elephant, so clearly these three little ones need a change of clothes. 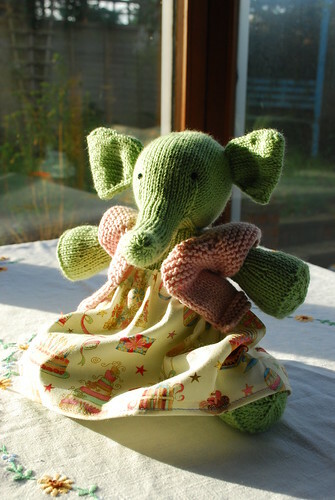 … sports a jacket in green baby cashmerino, and a skirt covered with pictures of cakes, and biscuits and all good things. Little Green (now with little Miss K), stylishly models a jacket in palest pink Rowan Wool Cotton, and a skirt patterned with giant cakes and glasses of champagne. And little Pink, who may not get so many changes of clothes if N is only one, is attired in a pale blue Wool Cotton jacket, and a pastel polka dot skirt. Their jackets did all get buttons, but it wasn’t sunny that day! I’ve posted the jacket pattern before here (scroll down to the bottom). The skirts are made with a rectangle about 6 or 7″ by the width of a fat quarter and some 1/4″ elastic (or whatever you have in your workbox). With the bottom long edge, fold up 1/4″ wrong sides together and press. Then fold that strip up again on itself (to enclose the bottom raw edge), and sew along that edge. On the top long edge, fold down 1/4″ wrong sides together and press. Then fold that strip down again 1/2″ on itself (to make the casing for the elastic and enclose the raw edge) and sew from the back, as close to the edge as you can manage. 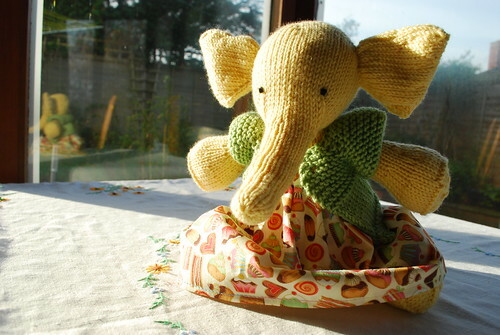 Wrap the elastic around the waist of your elephant, pulling a little to put some tension in, and cut with a 1/2″ overlap. Thread the elastic through the top casing. Fold the skirt, right sides together and sew the side seam with 1/4″ seam allowance. I tend to start about an inch down from the top and reverse stitch to the top before sewing down and then reversing up an inch from the bottom to make the seam secure. If I had pinking shears this is where I would pink the raw edges of the seam to make them pretty, but I don’t so I just tidied away all the loose ends. 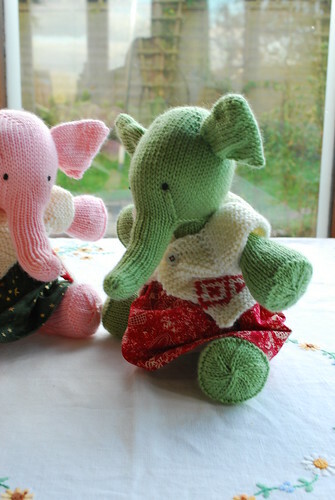 Despite a little bit of crazy in getting everything done in time to get to the post well in advance of Christmas, I had fun making these little ones, and great fun designing their outfits from the available fabric stash. I hope that the little girls like them. 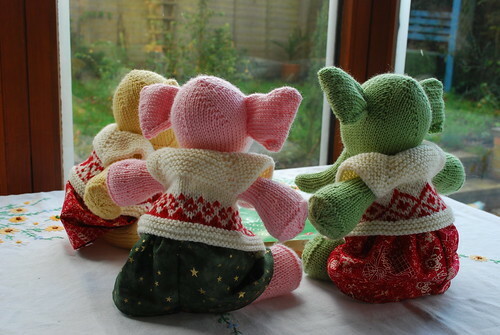 But even if they get stashed at the back of the toy box, their parents know that we cared enough to make something for the newest part of the family, and to spend that time thinking of them, and the girls and all of our hopes and dreams for the girls’ future as part of a frankly giant extended family.